American indie rock band Cold War Kids comes from Long Beach, California, the United States. The band was founded in 2004 by Nathan Willett (lead vocals, piano, guitar), Jonnie Russell (guitar, vocals, percussion), Matt Maust (bass guitar), and Matt Aveiro (drums). They quickly started recording demos, which eventually were transformed into extended plays. The band attracted some labels and they were signed to Downtown Records in 2006. The same year saw their debut album Robbers & Cowards. The album received quite positive reviews and spawned a single "Hang Me Up to Dry”. The song was broadcast on some radio stations in the U.S., UK, Canada and in Australia. The next album Loyalty to Loyalty came out in 2008. It received quite mixed reviews from the critics. 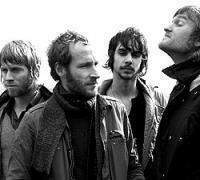 You can download the albums by Cold war Kids in mp3 from our site.